In the MKMMA glossy brochure its all about taking a six month journey of self-discovery and learning to create your dreams of a better life. What they don’t stress enough is that the process is very effective at creating change. And they fail to mention that you might first experience that change through the collapsing of old structures that are obsolete in the new life you are envisioning for yourself. Okay, so there is no glossy MKMMA brochure. But I have had some structures built on wrong-thinking collapse to make way for the new in these first three weeks — especially this week. The result has been a stumbling forward kind of week. By that I mean I can feel my life moving forward towards the direction of my DMP. There’s been some exciting new developments, a dash of synchronicity, and new answers to old problems. However the changes it’s creating in my life had stumbling a little when it comes to getting my three DMP and scroll readings done every day this week. I could give all sorts of stories as to why, but in the end they’re all excuses. It’s all about my fear and my restricting the flow. Yet despite my stumbles, I haven’t beaten myself up about them. On one particularly hectic and even harrowing day, I came to appreciate and fully understand the part about doing your best. Some days doing my best isn’t going to be as great as other days, but it was my best for that day. And I take comfort in knowing I did my best even on those days I didn’t do all the reading assignments. I also take comfort in knowing even though I’ve stumbled this week, I’m stumbling forward. 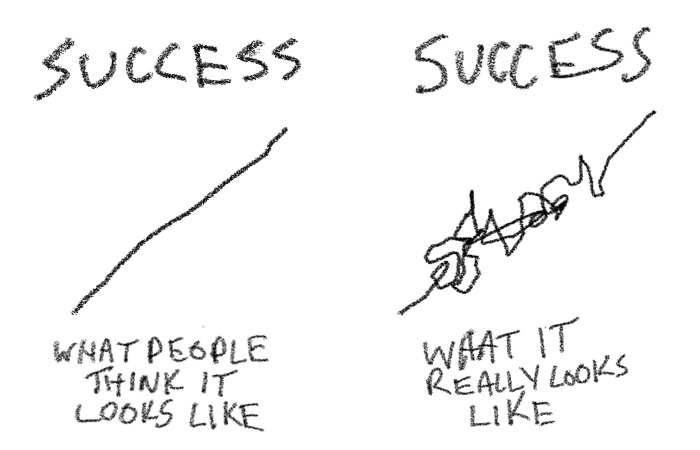 As the image in this post highlights — success isn’t a straight line. And though my stumbles this week I stayed aware of where I was in the process, when I was resisting, and what was causing me to resist and ultimately stumble. And that’s really good for me.